Welcome to Talay Naiharn Villa. 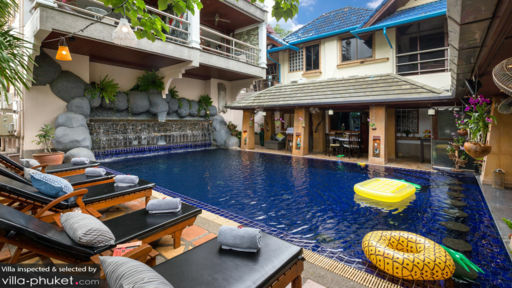 Ideally kitted for large travelling parties - the property will comfortably accommodate up to 20 adults and eight children - you’ll find 10 bedrooms, a lush tropical garden, two swimming pools, game room, fitness facilities, spa rooms, multiple outdoor spaces and more spread out across the compound. 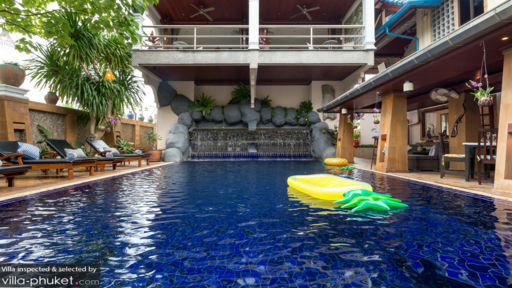 The villa occupies a prime location too (it’s just a skip away from Nai Harn Beach), which makes it a great vacation home for relaxed seaside holidays. A total of 10 bedrooms are spread out across the property. The main villa accommodates up to 10 adults and six children, while the annexe accommodates eight adults and four children. Five of the bedrooms feature king beds and an en suite bathroom. The sixth bedroom contain twin singles, along with an en suite bathroom with jacuzzi; the seventh is similarly furnished, but contains an additional pull out bed. The eighth bedroom features a king bed and queen bed, as well as an en suite bathroom with jacuzzi. The ninth bedroom, featuring an adjoining kids bedroom comes equipped with a king bed, twin singles and en suite bathroom. The tenth bedroom has a mezzanine level, and features a king bed, queen bed and en suite bathroom. Want to cool down with a refreshing dip? You’ll have two sparkling pools at Talay Naiharn Villa to choose from. Once you’re done with your swim, dry off against one of the recliners upon the sun deck. The grounds are beautifully manicured, and are abound with tropical foliage. Beyond the main villa lies a spacious garden; kitted out with hanging lanterns and a dining set, it offers an atmospheric setting for garden dinner parties. All across the property, you’ll find breezy terraces and outdoor spaces outfitted with dining and lounge furnishings - just perfect for a relaxed afternoon spent enjoying tea or a shaded siesta. With multiple living spaces and amenities spread out across the property, Talay Naiharn Villa offers something for every vacationer - whether you’re in the mood for quiet relaxation, hanging out with friends and family, catching up on your fitness routine or enjoying a spa treatment. There’s a well-appointed living room complete with plush sofas, a flat screen TV and a 10-seater dining set. There’s a games area furnished with a pool table too, and a fully equipped gym that has everything you need to work up a sweat. If you’re looking to have an immersive wellness experience, you won’t need to step out to a spa - the villa is fitted out with a spacious underground treatment room complete with steam and sauna facilities. Hosting a dinner party will be a breeze, since the villa features both indoor and outdoor dining spaces, along with a fully equipped kitchen and wine cellar. Your stay at Talay Naiharn Villa comes complete with housekeeping service and guest services. Car, scooter, boat rental also available at additional cost. Talay Naiharn Villa is located in South Phuket, about seven minutes’ drive from Nai Harn Beach. It offers easy access to a wide variety of restaurants; popular dining venues like Rock Salt, Rum Jungle Cafe, Mom Tri’s Wok Pagoda and The Boathouse Restaurant are five to 15 minutes’ drive from the villa. You’ll find a diversity of attractions in South Phuket - from the beaches, nature sites and viewpoints, to temples, kids clubs, arts and culture sites and more. Big Buddha, the island’s landmark attraction is a must-see item to be included in your itinerary. Also well worth visiting are Windmill Viewpoint or Black Rock Viewpoints; both offer sweeping views over the island, but the latter isn’t recommended if you’re travelling with young children, as it does require a steep climb to ascend to the peak. Then there’s Phuket Art Village, an arts commune featuring a collection of home-studio-galleries. Here you’ll get to interact with, and watch local artists as they work on their crafts - which ranges from performance art, to wood carving and oil painting. And at Chalong Bay Rum Distillery, visitors are taken on a fascinating tour of the facility, and have the opportunity to participate in a cocktail making workshop. Kids will enjoy spending the day at Rawai Park or Surf House Phuket; the former is a kids club for children between the ages of two to 14, while the latter is an artificial wave sport facility more suitable for older children. Or plan a family trip to the picture-perfect Maiton Island, where you’ll spend the day snorkeling, sunbathing and exploring the island.